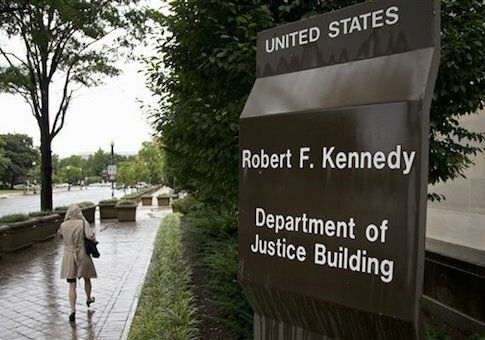 Leading members of the House and Senate judiciary committees called on the Justice Department on Friday to cut off the flow of hundreds of millions of dollars of proceeds from seized property to police departments around the country. The congressmen said in a letter to U.S. Attorney General Eric Holder that the Justice Department should stop distributing funds from its "equitable sharing" program, which pools money seized under asset forfeiture laws and shares it with law enforcement agencies across the country. "We believe that in many circumstances, civil asset forfeiture is a valuable tool in combating serious wrongdoing," the lawmakers wrote. "However, we have concerns that the government is not using the process fairly and instead is infringing on the rights of small business owners and motorists, some of whom are our constituents." Friday’s letter was signed by Senate Judiciary Committee chairman Chuck Grassley (R., Iowa), House Judiciary member Jim Sensenbrenner (R., Wis.), Rep. John Conyers (D., Mich.), and Sen. Mike Lee (R., Utah). Under civil asset forfeiture laws, police can seize property—cash, cars, guns, houses—suspected of being connected to criminal activity. The practice is intended to disrupt organized crime, especially drug trafficking. However, civil liberties advocates say the practice often ensnares regular citizens who sometimes aren’t even charged with a crime, much less convicted. News reports over the past year have revealed that police departments seized hundreds of millions of dollars from drivers, small-business owners, and other citizens without charging them with crimes. Critics of the program say asset forfeiture creates perverse incentives for police to seize property from citizens, a concern echoed by the lawmakers in Friday’s letter. "We are concerned that these seizures might circumvent state forfeiture law restrictions, create improper incentives on the part of state and local law enforcement, and unnecessarily burden our federal authorities," the lawmakers wrote. The Washington, D.C., Council passed a measure late last year reforming its asset forfeiture laws after a Washington Post investigation reported that the D.C. police planned its budget years in advance with asset forfeiture proceeds in mind, despite federal guidelines. Under the new rules, assets seized by the Metropolitan Police Department will go into the city’s general fund, not directly to the department. Many states have similar rules that funnel asset forfeiture money to community programs. However, as reported by Muckrock, local police agencies are able to circumvent the rules by participating in the Justice Department’s equitable sharing program. In an interview with the Washington Free Beacon, Darpana Sheth, an attorney with the Institute for Justice, called the lawmaker’s letter "a great development that spurs accountability." Sheth said the equitable sharing program presents a federalism problem. "A lot of states have decided that money should go to victims funds and schools," Sheth said. "It’s a travesty that through this program police departments can unilaterally go against what the citizens said and use it for law enforcement." The Institute for Justice, a public-interest law firm, is currently suing the city of Philadelphia to shut down its aggressive asset forfeiture program. The city recently dropped its efforts to seize the houses of two families after the cases drew national headlines. According the lawmaker’s letter, the Justice Department is currently conducting "an internal, top-to-bottom review of its entire asset forfeiture program." In a statement to the Washington Post, a Justice Department spokesman said: "Over the past year, we have been engaged in a comprehensive review of the Asset Forfeiture Program, including consideration of changes to the adoption policy, as well as other aspects of the program. The purpose of this ongoing review is to ensure that the department uses federal asset forfeiture authorities carefully and effectively." This entry was posted in Issues and tagged Eric Holder. Bookmark the permalink.